What Is First Aid And Its Applications - Learn More at Real Response! In one sense, first aid is understood as assistance or treatment delivered to someone who is ill or injured, prior to the arrival or medical professionals. Although this definition still holds true, the role of trained first aiders has expanded, in some case emulating professional medical intervention using the same techniques, equipment and devices. In other words, the capacity of first aid to save lives is greater than ever before, and with Real Response guidance, the skills can become lifelong attainments to be proud of. Fortunately, most people don’t face low-frequency, high-risk emergencies often. However, when things go wrong and people need assistance, it’s important to have someone on hand to deliver life saving procedures. First aid contains scope for helping in any emergency situation, and with health and safety increasingly in demand around Australia, the attainments are more valuable than ever. When delivered by highly qualified and capable Real Response instructors, the knowledge and skills become second nature, ready to be called upon whenever required. 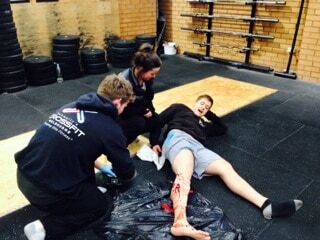 Are accredited first aid qualifications necessary? Emergencies can happen anywhere and at any time, and a fast response can make the difference between life and death. Although it’s true that some help is better than none at all, the value of trained first aiders shouldn’t be underestimated, particularly when lives are at stake. For example, a person suffering cardiac arrest will be benefited by chest compressions performed by an untrained bystander, but the chances of survival are greatly improved with the addition of properly regulated compressions, airway management and other essential techniques. With the addition of a portable automated external defibrillator (AED), survival rates are dramatically improved. Appropriate first aid qualifications are expected in many industries, such as the electricity supply industry, where danger is not far away. In addition, most progressive employers expect a percentage of their workforce to be trained in first aid to satisfy workplace health and safety guidelines. First aid qualifications are a great way to expand workplace responsibilities, achieve promotion, or even establish an entirely new career where first aid skills are prominently displayed. Is the Provide First Aid course available in Sydney? What does the first aid CPR course in Sydney include? First aid training courses at Real Response not only save lives of casualties, they also transform the lives of the first aiders themselves. Our course graduates develop self-assured confidence, teamwork and leadership skills, plus the initiative to take decisive action when no one else will. Our Sydney headquarters, located in the heart of the CBD at Level 3/50 York Street, is ideally located for all Sydney residents. Our in-house training is unequalled thanks to progressive first aid training techniques. Our first aid instruction methods are also perfectly suited for on-site training at your workplace, school or community setting. Real Response simulation experts will transform your premises into a mock emergency environment for realistic emergency response training using actors, props, real emergency equipment and much more. Simulation based first aid training encourages genuine first aid capabilities that are deeply absorbed and easily recalled in any real emergency.